Football season is back! I’m quite excited, even if the National Football League arrives around the same time as colder weather, the school year, and an over-abundance of pumpkin spice (the one with snow bothers me a hell of a lot more than the others). Although the NFL isn’t perfect (racial issues, players committing crimes, greedy owners, and a commissioner that does whatever he wants), it is almost always interesting and fun. I can only imagine most football fans were like me in that they didn’t see Thursday’s Chiefs victory over the Patriots coming. The defending champs in New England were the big favorites in that game and indeed to win the Super Bowl once again this year (which will be played in my home state of Minnesota, by the way). I love football by itself but I also have a huge passion for fantasy football. I try to have seven teams every season, which some people consider to be a lot. The most common question people have is “What happens if you have a player on one of your teams and you also play against that player in another league?”. It doesn’t bother me much, to be honest. I figure everything evens out eventually and the better managers will win more games despite any players they might be cheering for and against each week. I was doing an online draft with strangers for one of my teams recently and two of the other people admitted to having 25 and 55 teams each! Now that’s a lot of fantasy teams! Suddenly my seven doesn’t seem so extreme. Now for the football related maps! Map 227, one of my own creation, shows how many players I drafted (or kept as keepers) that play their home games in each state. There are several players that I drafted multiple times in my leagues, such as Jonathan Stewart, the aging running back from the Carolina Panthers. I have him on four of my seven teams for some odd reason, which is nearly half of North Carolina’s nine in the map below. Some states have multiple NFL teams which give them an unfair advantage in totaling more players on my teams. California now has four with the Rams and Chargers moving to Los Angeles in the offseason (there is a decent chance the Raiders will move from Oakland to Las Vegas soon so that would bring the number of teams back to three). Florida has three teams; the Jaguars, Buccaneers, and Dolphins. Texas, Ohio, New Jersey, and Pennsylvania all have two teams each (and yes, both the New York Giants and New York Jets call New Jersey home). The fifteen NFL teams from these six states contain only 42 of my 120 players. That’s 46% of the NFL franchises and only 35% of my players. The other seventeen teams fill 54% of my seven rosters because I loaded up on a couple teams, including my Minnesota Vikings, the Carolina Panthers, the Tennessee Titans, the Atlanta Falcons, and the New England Patriots. All of those teams are likely to be in the top half of the league which is usually a good indicator of successful fantasy football players. Players on crappy teams can still be good for fantasy managers, of course, but the best teams have higher volumes of the best talent. I also have a bunch of Raiders on my teams and zero Jets. Have I dove deep enough into my rosters for you yet? I assume I’ve lost 90% of you so let’s get on with our next map (which might earn me 12% back if I’m lucky). Map 228, which is actually in three parts, shows the home of my beloved Minnesota Vikings, US Bank Stadium. This series of maps shows several facets of the two-year-old stadium. The first is the seating chart. Beth and I toured the stadium during a free open house event they had last year and I have to imagine there isn’t a bad seat in the place. 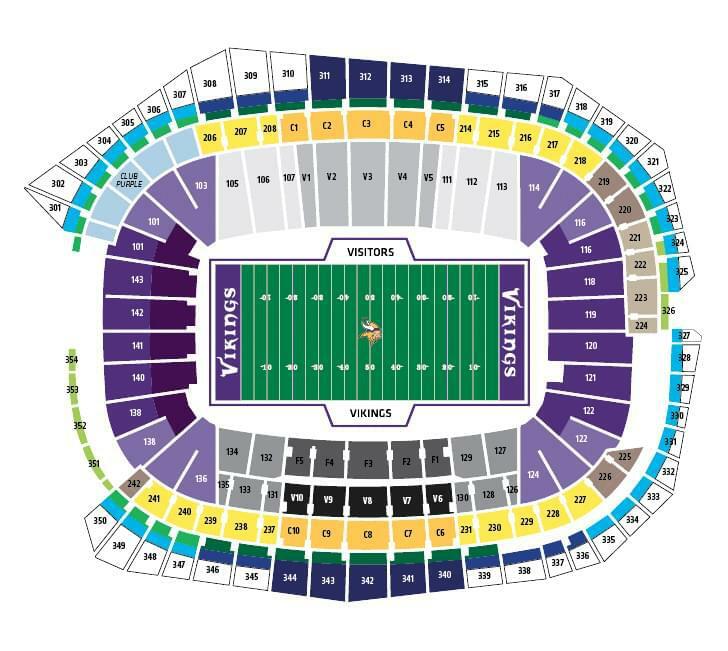 If tickets weren’t so expensive (and my budget for non-life-sustaining activities so low) I would gladly attend thousands of Vikings games and personally try out each one! I’ve only attended one sporting event at the stadium so far and it wasn’t a Vikings game. Beth’s family and I attended a women’s international friendly soccer match between the United States and Switzerland and sat in row eight or so of Section #140 (check that seat off the list, only 66,654 more to go). The second map above gives more attention to the gates and the grounds of the stadium. Like the stadium itself, most of the gates and other areas have been named for large companies, most of which are headquartered in Minnesota. The Legacy Gate, on the Medtronic Plaza, is the exception to the naming and is considered the main entrance. The grounds include lots of room for vendor tents on game days, a Viking ship, and a modern art sculpture of a Viking horn. The third and final map shows the many parking lots available for events. US Bank Stadium is in an urban environment, the East side of downtown Minneapolis, so parking is really spread out. The many lots are smaller than needed and can be up to a fifteen minute walk if you’re cheap (parking gets more expensive the closer you get). Many other pro stadiums around the country have parking surrounding them so people can park very close. Our stadium does force people to walk a decent distance if they drive into the city but there are public buses and the light-rail that drop people off right at the main plaza. We also have the benefit of the beautiful downtown skyline out our stadium’s giant windows instead of acres of parking. Here are some pictures from the open house event Beth and I went to last year for your viewing pleasure. Bonus Map Link: Map of Barbuda, an island in the Atlantic that was recently ravaged by Hurricane Irma. Its 1800 residents are in dire need of financial assistance already and Hurricane Jose is also headed straight for the tiny island.